Chicken Francese – Chef Tom Cooks ! Fill a shallow dish with ½ cup of flour. Season with salt and black pepper. In another shallow pie plate, crack 3 eggs and beat with a fork. Season your chicken breasts on both sides with salt and pepper. Heat the olive oil in a large skillet on medium-high. Dredge both sides of the chicken in the flour, and then dip them in the egg wash to coat completely, letting the excess drip off. When the oil is hot, add the chicken and fry for 3 to 5 minutes on each side until golden brown and cooked through, turning once. Remove the chicken to a large platter to keep warm. Place your lemon slices in the pan and cook for 1 to 2 minutes. Add the wine, chicken broth and lemon juice. Scrape up any bits off the bottom of the pan. Let simmer for 5 minutes until the sauce reduces slightly. In the meantime, combine the remaining 1 tbsp of flour with the softened butter in a small bowl. Mash it with a fork until there is no loose flour left. Add the butter mixture to the pan and blend it into the sauce until it starts to thicken. Once the flour is completely dissolved, turn the heat to medium-low and return the chicken to the pan. Place the lemon slices on top of the chicken. Simmer for about 2 to 3 minutes to heat the chicken through. 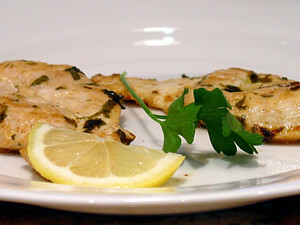 Season with salt and pepper and garnish with chopped parsley before serving.